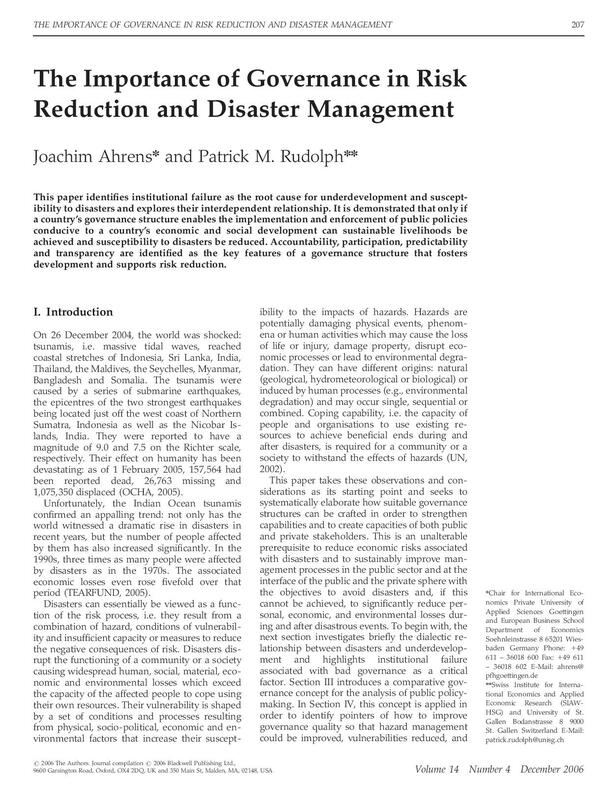 The paper written by Joachim Ahrensn and Patrick M. Rudolphnn explores the relationship between good governance and disaster risk reduction. It identifies institutional failure as the root cause for susceptibility to disasters and underdevelopment in any country. It is country’s governance structure that enables the implementation and enforcement of public policies to achieve the goal of sustainable livelihoods and reduce susceptibility to disasters. Paper points out that there exists the vicious circle between underdevelopment and susceptibility to disaster, risk reduction and disaster management. This vicious circle can be broken by integrating DRR and Disaster management to the sustainable development. It needs effective governance structure with key feature of accountability, participation, predictability and transparency. Good governance fosters development and supports risk reduction.